There’s a difference between the blues and jazz. Oh, sure, they’re closely related. And as you play jazz solos on a saxophone, for example, that’s all rooted in blues scales and theory. But the blues are blue for a reason. That music is often about hurt… things like your lover dumping you for somebody else, your dog running away and your whiskey bottle running dry… often in the same weekend. For example, right now I’m in Bimini. Waded a bonefish flat in the morning. Then went diving with reef sharks at “Bull Run.” Snorkeled around a hidden blue hole Jacques Cousteau discovered years ago, but has been virtually unexplored for years. Now it’s Kalik o’clock, and the sun just set over the blue water where I’ll be chasing wahoo in the morning. The only thing blue about that is the water itself. To be sure, you can find many bluesy, somber themes in standard jazz—“Mood Indigo” comes to mind. 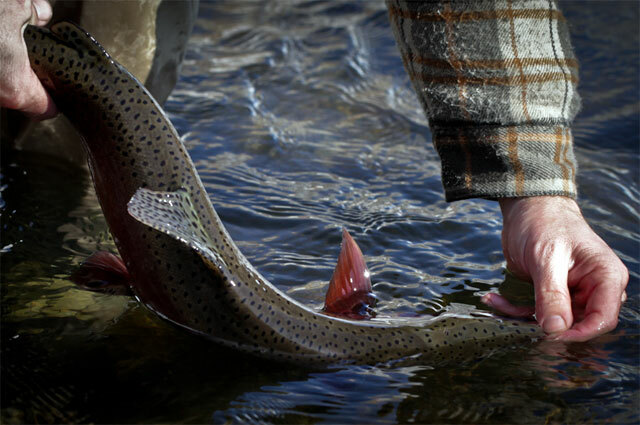 But sometimes, in fact most of the time, when you’re on a trout stream in Michigan, or a saltwater flat in the Bahamas, fly fishing is definitely more Dave Brubeck in tone and tempo than it is Muddy Waters. If you have the blues, fly fishing is a good cure. Planting your feet in moving water is one of the surest recipes I know for turning the blues into jazz. Sometimes, we just need to “Take Five” and realize that. And when the riff is happening, let it run. Let it flow. Allow yourself to be caught up in the moment. And stay there as long as you possibly can. When you’re locked on happy, it’s always summertime, and the fishing is easy.